A Diocesan quinquenial highlighted that a new roof was a priority. Church members were sitting between strategicaly placed buckets which were there for a purpose. To catch rain water frrom the leaking roof. During 2014/5 St Anne's applied to various charities for grants. Reverend Vivien Hatton worked hard to secure a large grant of £160,000 from English Heritage. It was then up to the congregation to raise further funding of approximately £80,000 to replace the whole of the church roof. Various people made special efforts to substitute the fund by creating social activities. 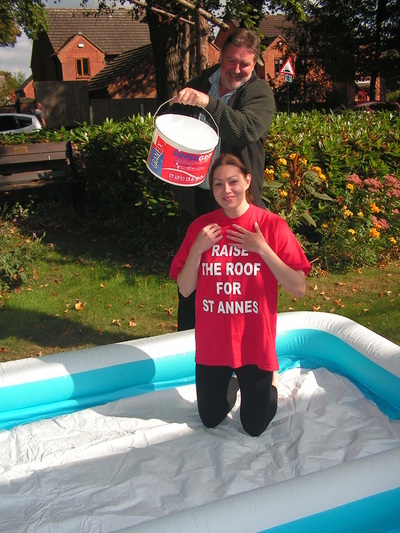 Keeley Brookes raised money by participating in an Ice Bucket Challenge. Keeley raised £200 towards the church roof fund.